A high proportion of crystal malt in Old Speckled Hen provides the key toffee/caramel flavour. The yeast used to ferment the beer provides the other key character – estery or banana/pear drop. This estery note provides the fruity and refreshing balance. The hops used add a palate cleansing herbal note and very slight orange citrus. A very malty, full bodied and warming ale. 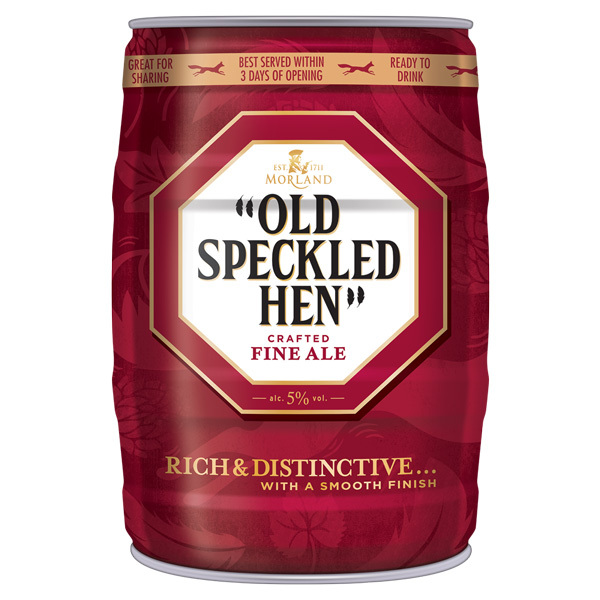 Interestingly, Old Speckled Hen was named after a car. The beer was first brewed to celebrate the 50th anniversary of the MG Car plant in Abbingdon. They chose the name ‘Old Speckled Hen’, from a paint-spattered MG Featherlight Saloon. Back in the day, this was the MG factory run-around, fondly referred to as the “Owld Speckl’d Un” due to its mottled appearance after several years parked under the paint shop. …as you keep telling us every time we drink it or even mention Morland or Greene King.